White Oval UFO Seen Over Forested Area Of Quebec, Canada ( November 10, 2018 ), VIDEO, UFO Sighting News. This UFO was caught hovering over a forest area of Quebec a few days ago. The person noticed it while driving and pulled over in time to catch it for a few more seconds. The objects shape closely resembles that of the Star Trek Voyager ship from the TV show. This UFO is white so is easily confused with a cloud, but its obvious that the object is a smooth hard white surface. The ship appears uneven because it was not made, but grown…bioengineering makes crafts for you, they grow and learn. This looks like just such a craft. I was a trucker, I was coming back from Le Havre St-Pierre, at the exit of Mingan Point, my attention was attracted by an object in the sky, the more I approached more believed a kite that would have been on the beach, but it was not that! absolutely not. There was no wire, no noise, no smoking, it was almost moving, but it was almost stationary. I saw little wings and it was as big as a hot air balloon. I filmed some time, I do not know why I went my way? I recognized the truck that was last to mine, I spoke to the driver Richard, he also told me “but what was it? He was not caught taking a picture. He claims that it is not a known object. 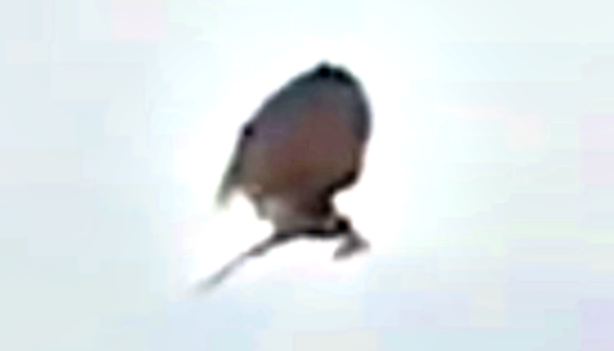 Next Post:Glowing UFO Recorded Outside House On Harsh Windy Day, Argentina, Nov 2018, Video, UFO Sighting News.